Are you looking for quick and breezy way to format and convert text case? 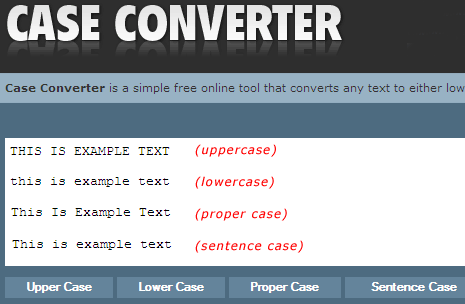 Case Converter is an online tool that can convert case of any copied text real quick. Just type or paste text in online editor and hit the required case converter button at the bottom to get the final case converted text. You can convert the text into uppercase or lowercase. It also has option for proper case and sentence case conversion which is ideal for paragraph format type of text. Bookmark Case Converter website and perform the quick case conversion on the fly. After the conversion, you can also save the final text in a notepad file using save option at bottom-right. Neat and handy! Ok this might come to you as a surprise but I was just about to search on Google for converting letters to Uppercase. Perhaps you got an excellent quick intuition :D The website is EXACTLY what I was looking for. Oh well, thank you! You are welcome, Rockstar !